Repair and defend against threats like climate or other unexpected conditions impacting regional communications. 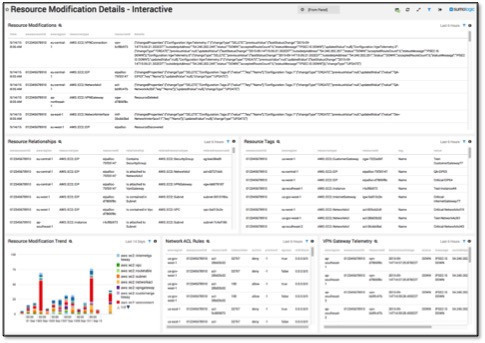 Our built‐in filtering capabilities allow you to enable customized dashboard views to zero in on sudden provider or dependency shutdowns. With our easy, interactive graphics there is no need to scour raw data streams for vital information, saving time and overhead. Imagine a crystal ball that enables you to see all of your AWS details at once, identifying and fixing potential problems with a click before they happen. Sumo Logic has the app for that. The Sumo Logic App for AWS Config integrates seamlessly with native AWS Config features, supercharging them. The Sumo Logic app turns all of your critical data into simple, interactive visualizations that help you manage logistics, resource dependencies and relationships, security, technical and networking challenges and more. From within the intuitive Sumo Logic app dashboards you can develop unique and actionable insights to get the most out of AWS. A wizard uses a crystal ball to gaze on and influence faraway events, some in the past and some of which haven’t even happened yet. Sumo Logic’s Live Overview Dashboard for AWS lets you do the same, compiling torrents of raw data from all over the globe into simple to understand infographics that chart history, trends and more. By providing full-stack visibility in real-time for all AWS operational and security processes into comprehensive but clear screens, the Sumo Logic app works to reveal success and even looming problems. These and other monitors are displayed through intuitive tracking filters, visualizing trends so you can stay ahead of coming changes to the AWS marketplace. Take a magical leap forward from current visualization technology for AWS with the Live Overview Dashboard. Its unparalleled detail and planning control for your AWS, all with easy, interactive graphics that will save time and overhead and give you a competitive edge. But the Live Overview Dashboard is only your crystal ball at rest. When you really want to channel its powers, the Resource Modifications Dashboard enables insights and change-tracking on the fly. Delve deeper into what resources were modified and monitor or adjust resource relationships from one central screen. Simple visualizations reveal broken or threatened dependencies, letting you repair and defend against threats that could disrupt your services. The Resource Modifications Details Dashboard also provides a central place to monitor and manage network access control list (ACL) rules and VPN gateway telemetry, ensuring that all processes and traffic have the proper authorization to interact with dependencies. 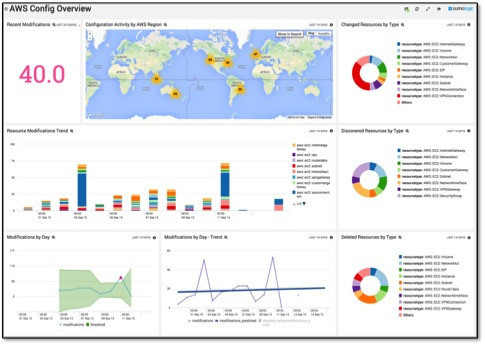 By centralizing control of security and resources in one simple interactive screen, the Resource Modifications Details Dashboard takes mastery of AWS to unparalleled levels. Resources and dependencies can number into the hundreds. Other AWS Config integration apps collect this raw data but offer no intuitive way to review and act on it. With its built in filtering capabilities, the Sumo Logic app for AWS Config enables customized dashboard views with a click so you can focus on exactly the details you want. Quickly display new resources and their relationships. Zoom to a region to closely investigate its challenges and potential. Prune dead dependencies and more, all with Sumo Logic’s unmatched visual interface. With the Sumo Logic app for AWS Config, continuous intelligence and control of your resources is now a reality. Integrated with other groundbreaking Sumo Logic apps like VPC Flow and Amazon Cloudfront, a simple display screen become the crystal ball you need for wizard-level mastery of Amazon Web Services. View the video to see how Sumo Logic Log Management and Analytics Service™ effortlessly collects, manages, and transforms all of your log data, regardless of volume, type or location, into operational efficiency and security insights.